I grew up with two big brothers and for a while I was the little "brother" that all his friends knew. As I grew older I remember thinking, why wasn't I born a boy? I mean I just loved dressing in my brother's clothing and for a while I HATED being in dresses and skirts, although my mom insisted that I wear them. After a day in church, the only place where I wasn't allowed to wear jeans, I couldn't wait to get home and take those dresses off. While I still like to think of myself as a "tomboy" at heart, I'm also very much a girly girl. I am still a big fan of jeans and tees, but I can also be comfortable in a dress and heels and sometimes the occasion calls for it. However, as a mother, I also need a bag that's functional, but still stylish. You know the bag that can hold everything that you and/or your toddler need as well. I'm talking about the extra packs of wipes, hand sanitizers, the portable game system, etc., the stuff that keeps our kids happy. So when I was approached by the Robert Matthew team to take a look at one of their new arrival, I was more than happy to say yes, because when I step out the door, especially with my pre-schooler, there is no need for anyone to know that my bag is filled with "baby supplies". Can you tell below? Now I had heard of Robert Matthew before from my very fashionable, now adult daughter, and if you read the post title and if you know my daughter, you may have figured out why. My oldest daughter is a vegetarian, not quite vegan, but she doesn't believe in the harming of any animals when it comes to beauty. She buys vegan cosmetics and tries to do her part in taking care of the creatures of the world. Robert Matthew, even though their bags are vegan, does not compromise on quality or beauty. Just check out the Kate Shoulder Bag that was sent to me. It's a piece of work, let me tell you, or as I like to call it, elegance personified! It is also available in black for those who would prefer not to have the pale pink that I just love. Guess what? It also comes with it's very own dustbag, and we know only the finest of bags usually have those! So now I have something to store my new bag in to keep it looking as great as the day I received it. I just love how big this bag is, and while it doesn't look that way, it truly is. From the gold hardware to the tassle and braided accents, it just screams luxury. The double compartments, secured by magnets are big enough to hold everything that you can imagine and there is also a middle zipper compartment to keep your valuables extra safe, with all compartments lined with a polyester lining. As if that wasn't enough, on the back is another zippered compartment (shown below). The 8" braided handle is great for carrying over your shoulder or just holding in your hands, when you're in the mood to look even more sophisticated. This is my very first Robert Matthew handbag, but you can bet this won't be my last. All of their bags are gorgeous and truly a work of art. They are trendy, functional and reasonably priced. Whether you're just going out on your date night, to work or even a social gathering, carrying a Robert Matthew handbag will complete your look. With the holidays approaching, you may want to consider getting one for the handbag lover in your life, after all, who you can't go wrong with something this stylish, and a Robert Matthew handbag is like no other! 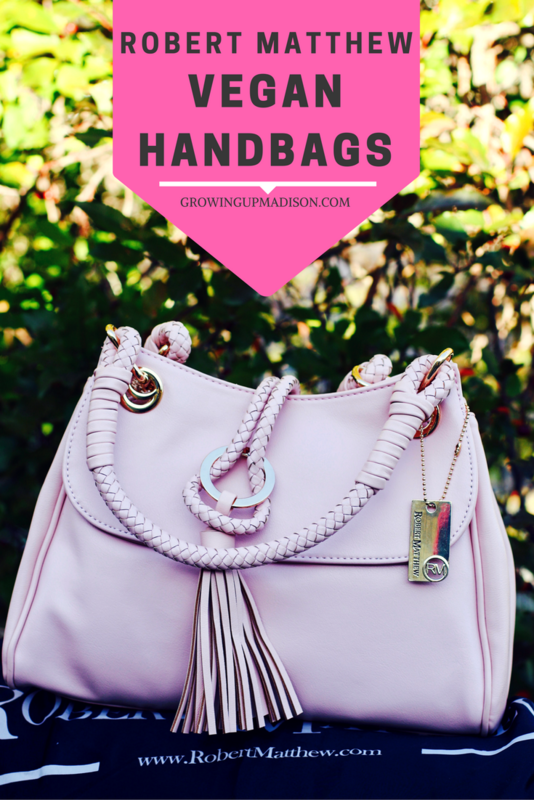 Let's discuss: What do you look for when purchasing a handbag? So gorgeous and I love the photos. I'm in the market for a new one actually. Mine is getting a little ripped! Not cool. I need lots of room because of kid stuff and I also like to put my camera in my purse at times. I do have a camera bag, but I still like this option. As well as a mini umbrella and a book! I'm like Mary Poppins. Thank you Tamara. You'll love this one. This is definitely your "Mary Poppins" bag. I'm like you, I like to have everything in mine as well, and this works out great. I plan on getting another, in a different style in another color other than black. I have way too many black bags. I've never owned a vegan handbag before, but then again all my bags are usually under $20. I don't spend much money on bags. This one is beautiful though and I can see why you love it. Having kids myself I like bags that can hold everything that I want. This is my second vegan handbag and I'm in love with this one. I love the other as well, but this one is bigger and so able to hold so much more stuff. This Robert Matthew handbag looks just gorgeous. I love how much room and pockets this has in it. The color and style are right something I really like in this bag too. 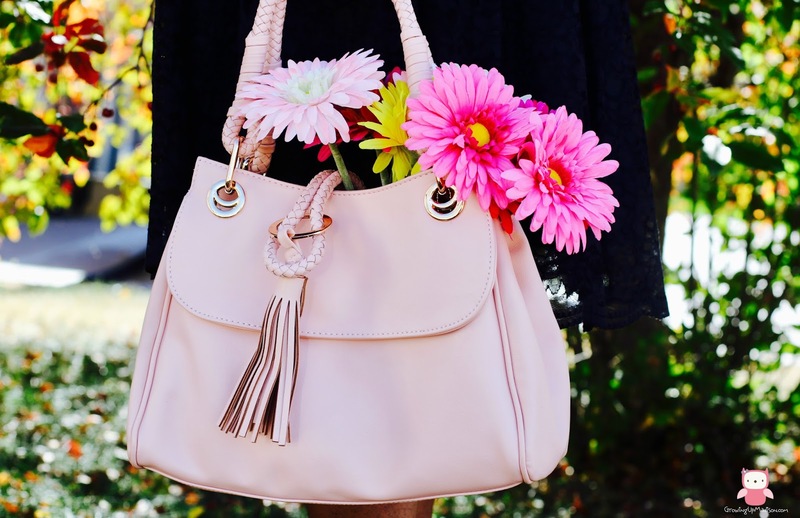 Thanks for sharing this gorgeous handbag. I'm in love with the color myself. I got tired of the same old black and this is gorgeous indeed. 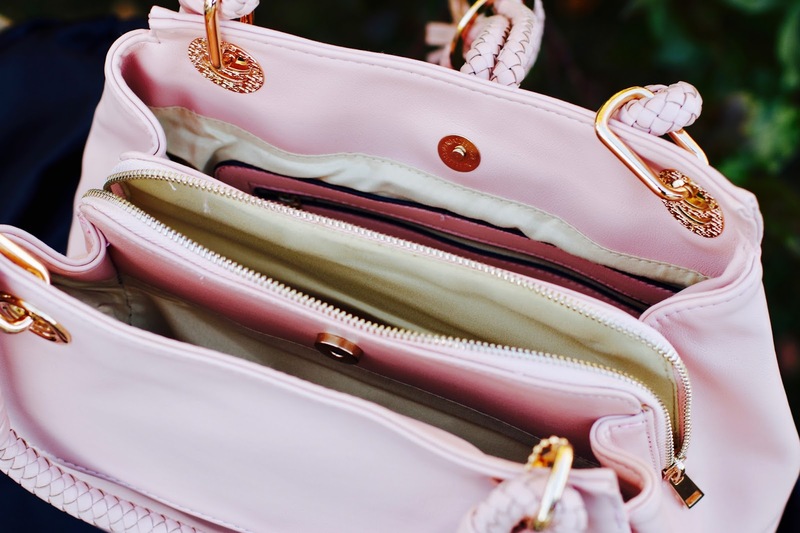 I'm in love with the pale pink color and the style of the bag. Knowing that it's vegan is a plus plus. My bags must hold lots of stuff, so this one is a winner. You're just like me. My bags has to be able to hold a lot of stuff too because I'm one of those who has to have everything in my bag. This is a gorgeous bag and I LOVE that it is vegan!!! Great post!! I also love that it's vegan as well. I think that's the best feature. I have never heard of this brand of hand bags!! They look like great bags for every day use and special occasions! Oh he has so much more and there's one that I'm really eyeing. Check them out! That is a beautiful person! I am a lot like you are. When I was a kid I always had to wear a dress I could wear jeans to church but the second I would get home I would be changing into something way more comfortable. I am still a bit of a tomboy but I do like to dress up every once in a while and this purse would be perfect for that. Hahahaha, yes that was so me. This year though I decided to buy a few more dresses but my closet is still filled with jeans and tees. I'm always in the market for a new handbag. I'm not familiar with this brand but I like what I see. Oh it's beautiful, check them out, because he has so much more! I love how stylish this bag is! And good to know that there are options available. Vegan is so much more than just a diet change, it's really a way of life. It really is, as my daughter would tell me. It's really not just about what you eat so she just loves this brand. I have been a fan of the Robert Matthew line for years. I had no idea they had vegan handbags. Awesome! I'm pretty sure that all of their bags are vegan, but I could be wrong. Now, that bag is too cute! I never knew that you could make a vegan bag. I have never heard of Robert Matthews, but I am going to have to check him out. Oh you most certainly should, and yes there are vegan bags. Just do a Google search and you'll be surprised at how many brands offer them. Never heard of this brand but Wow that is a great handbag! And there are even more to wow you on the website. This is such a beautiful handbag. I like all of the little details and it's nice to know that no animals were harmed making it. That is what I love about it too. No animals were harmed. Oh it most definitely can fit everything! Ever since the twins arrived, I knew I had to get bigger bags for myself. I think this is awesome and I love that it's divided by compartments, it keeps my things organized and easy to find! I love the color as well! This is definitely my kind of bag! Oh this is perfect for any mom at all. The compartments does make it easy to keep things organized. What a great alternative to leather. After seeing all the animal cruelty videos I'm definitely a bit more conscious when shopping products made out of animal skin and fur. So far I'm never buying down again, any kind of real fur and Ugg boots. I love that this handbag has so many compartments but it is not huge. I'm curious to see the whole collection. I try to avoid watching those videos myself. I still buy and wear my UGG's though, I gotta stay warm, but you should certainly check out the collection. This is vegan? Oh my goodness wouldn't be able to tell by the design athestics - I think I know what I am getting my partner for Christmas!! I think your partner is going to love it. What a great Christmas gift this will make. The Robert Matthew handbag is really cute, I had no idea they made vegan handbags! The color of this one is perfect - not too bright of a pink and would go with almost any outfit. I look for size and quality in my handbags. Yes they do and there is so much more to choose from. Check them out. I'm sure she would Raul. Omg what a fabulous bag!!! I'm a total bag girl so I will have to check these vegan bags out!!!! Too chic!!! And you most certainly should. I think you'll love them as much as I do. Gorgeous bag. I will consider this for shopping list for the holidays. And since it's on our Holiday Gift Guide, you know that we recommend them. Oh my goodness, I love that handbag. I'm going to see what colors the Kate Shoulder Bag comes in but I love the one you received. 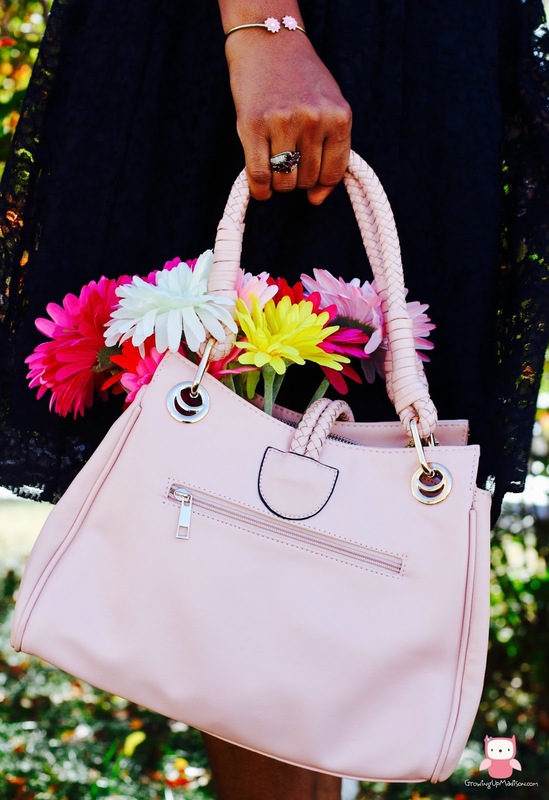 It comes in both black and pink but there are so many other bags for you to choose from. Then I'm thinking you need to add this to your list for the holidays for her. This one is so gorgeous! I've never owned a vegan handbag but would love to own like this. I've never owned one before either, this one is my first and I'm in love. My goodness these are some gorgeous handbags from Robert Matthew that I would love to grab right away. I have never had a vegan handbag before & it would be so exciting to own one. The prices are great too but there are even some awesome ones in the sale/clearance section and I have been throwing out hints to get another. Truly gorgeous bag for sure. I love the color you got. I usually go for darker colors when it comes to purses. Black is my choice of color. I usually go with black myself but I wanted a pop of color so this was it. the bag looks amazing specially seeing how many division inside and you can put a lot of things too! colour is so pretty! Oh there is so much space in the bag, you just can't believe it. I love how much I can fit in there with still space to go. I ussed to be boyish too until college. his is such a pretty handbag and I so love the color. That was the way I was myself but I can say that I'm not so much a tomboy anymore. My oldest daughter is a vegetarian, not quite vegan, but she doesn't believe in the harming of any animals when it comes to beauty.